At Potrero PT, we have seen hundreds of patients from a wide variety of age groups and injuries benefit from our aquatic therapy program. In a heated, indoor, saltwater pool, our therapists teach you a customized water program that is designed specifically for your needs. Water is the ideal environment in which to work on your range of motion, strength, and balance, and to decrease swelling and pain, because the water's buoyancy helps us control the degree of stress on your body's joints and muscle tissue. 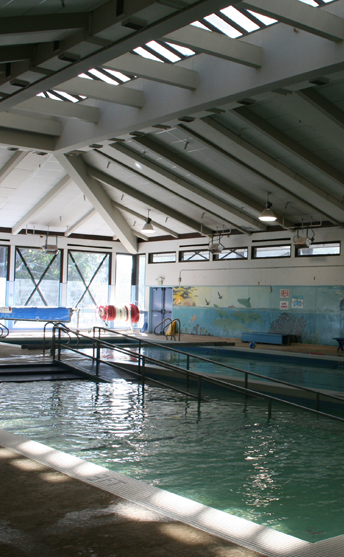 Below is a brief summary of some of the main benefits of aquatic therapy. Because water is denser than air, it exerts more pressure on your body, acting like a compression bandage and reducing peripheral swelling. A network of nerve endings within the skin and muscles can respond to the slightest stimulus. Under a constant stimulus, such as pressure from water that the body is not used to, the nervous system will automatically dull the body's reticular system, the part of the brain responsible for regulating tactile sensory neurons. This response can also help decrease muscle pain, making it easier for you to stretch your muscles and joints to their full range of motion. One of the biggest aquatic therapy benefits is the constant resistance water offers. We can easily adapt the exercise to your strength and function level by changing the positioning of your movement or the speed at which you move through the water. Water's natural viscosity and resistance force you to move slowly through a movement pattern, allowing the brain to process the signals from your muscles more thoroughly. If someone has a neuromuscular condition or other impairment, the use of water makes this muscle "reeducation" easier. Water that is typically used for aquatic therapy is kept at warmer-than-average temperatures (approximately 92 degrees Fahrenheit) because warmth promotes circulation. This Increased blood flow to the limbs helps promote healing.